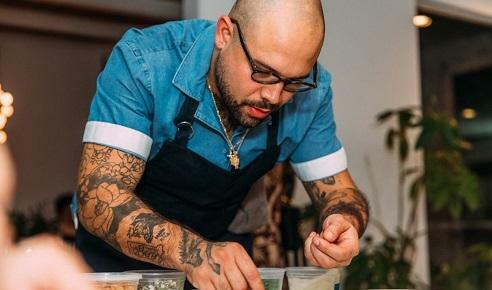 Creating dishes and culinary experiences that are as fun as they are unique, Chef Luke Reyes makes the art of the cannabis edible look easy. Reyes—along with business partners and friends Ryan Hope and Ben Gilovitz— recently founded La Hoja in Southern California, a cannabis catering and events company devoted to bringing the low-dose cannabis experience to dinner parties and events. For instance, they served their special “potsickles” at recent Coachella parties.